THUNDER (aka Anissa Pierce) and LIGHTNING (aka Jennifer Pierce) are the superpowered daughters of DC superhero BLACK LIGHTNING. After striking her bargain to wait until she graduated college, the eldest daughter Anissa donned costume and became Thunder the very day of her college graduation and was soon recruited by Red Arrow’s superhero team The Outsiders. She bucked heads often with fellow Outsider Grace, whom she eventually began dating. She has the power to control her own density and can do so to make herself invulnerable, and she can create powerful shock waves by stomping on the ground. She was recently kicked off The Outsiders team when Batman reorganized, but has helped the team out (without Batman’s permission) by collaborating her girlfriend Grace who is still on the team. 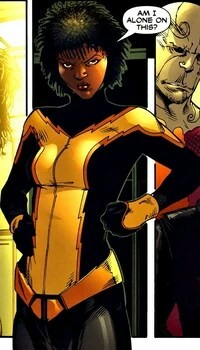 She first appeared in 2003 in Outsiders vol.3 #1. Jennifer Pierce was thought not to have any powers, until her powers manifested as a teenager. She gained the power to absorb electrical energy and project it in powerful blasts, and she can also use this energy to fly at the speed of light. But initially she had difficulty controlling her power and felt like a freakshow, so her father contacted the Justice Society of America who welcomed her, and though still in her teens, her father allowed Jennifer, who was more reluctant, to become Lightning. Created by Mark Waid and Alex Ross, she first appeared in Justice Society of America v.3 #12 in 2008. There is some tension between the two sisters, and they even fought each other when their father was a fugitive and Lightning as part of the JSA was charged with arresting him. Thunder took her father’s side and fought against her sister.